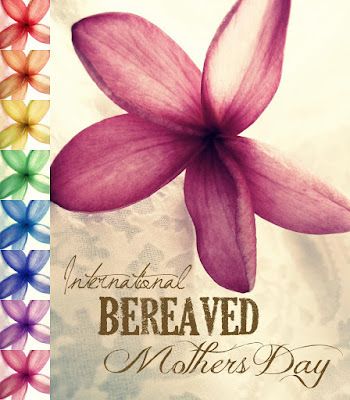 Sunday was International Bereaved Mother's Day (formerly Babyloss Mother's Day). It's a day set-apart to honor mothers who have lost children at any age or gestation. This special day falls on the first Sunday of each May, the week before "traditional" Mother's Day. I have been recognizing it since it started in 2010, the year Lily was born and died. "This day was created to get people to start talking about the real meaning of Mother's Day. Do you know who started it? Anna Jarvis founded the traditional Mother's Day to honor her mother who experienced the death of 7 of her children and somehow through the years it has turned into a commercialized mess that card companies make millions of dollars from, but the worst thing is that bereaved mothers are completely forgotten. This special day was created in 2010 to honor and celebrate the mothers who carry some if not all of their children in their hearts rather than their arms. In our modern day society, mothers who are grieving the death of their babies and children are usually forgotten. That traditional Mother's Day has proven to be an emotionally difficult day for so many mothers around the world. Just because your baby died does not mean that you are not a mother anymore. You are your baby's mother forever and people need to start recognizing this fact." Bereaved Mother's Day in no way replaces Mother's Day. What I wish is that there was no need for Bereaved Mother's Day. I wish I didn't even know about it and felt like a "normal" mom on Mother's Day. What the day is about is connecting with other mothers who know your pain and love. It's about bringing awareness to babyloss/child loss. It's about informing others of the real meaning behind Mother's Day.